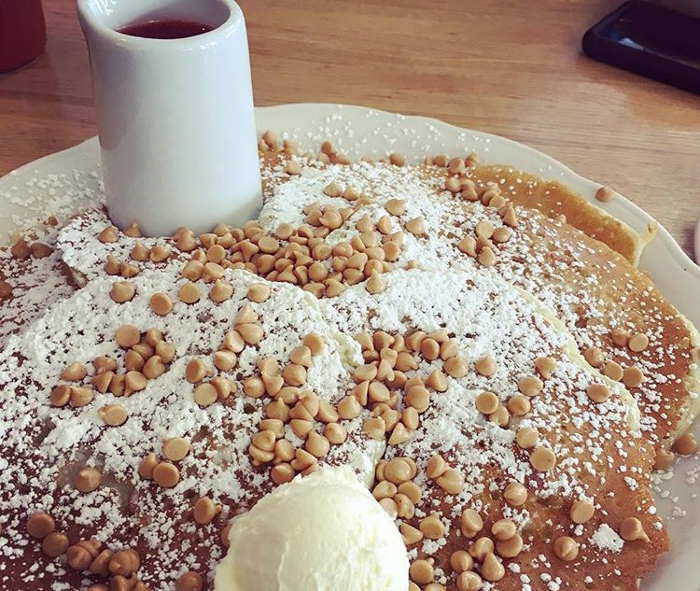 While we usually can’t wait to try the latest and greatest during our brunch adventures, we can’t deny the comfort in ordering the good ol’ pancake dish. 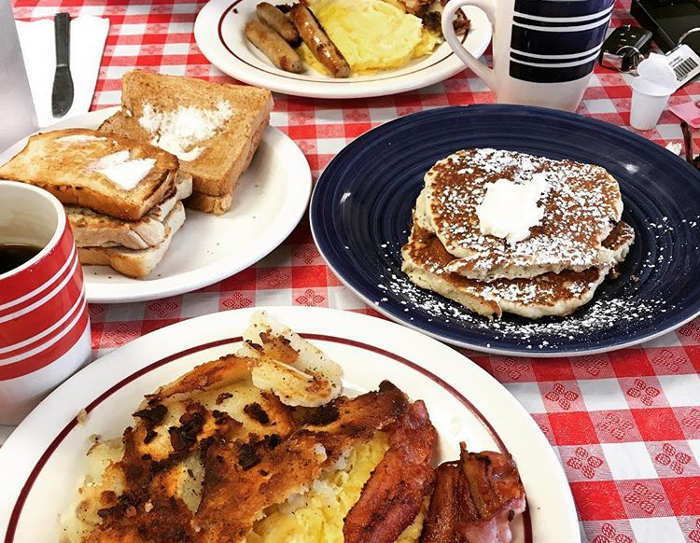 In this post we’re going old school with 8 brunch/breakfast spots where you should seriously consider going the traditional route. Friendly reminder: business hours and offerings change all the time, it’s always a good idea to call ahead and confirm things! People are going to the following brunch spots for many reasons. And truth be told, pancakes are typically not the sole factor – especially if you love to try new and inventive things, which of course we do. But we’re man enough to admit that that’s not a very good reason to miss out on some of the best pancakes you might ever have. 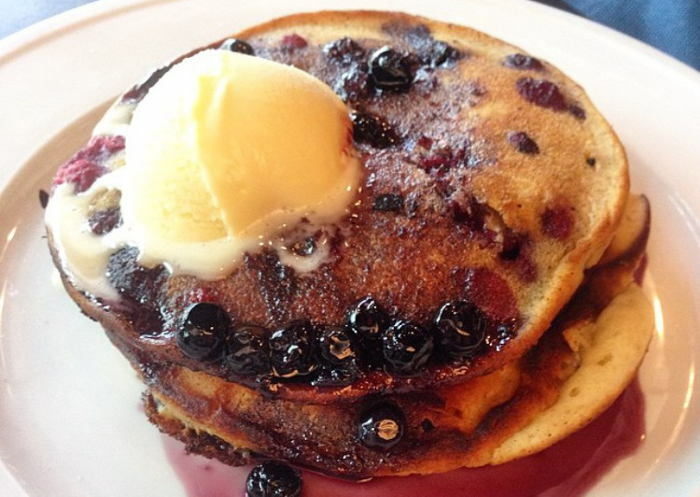 Believe it or not, we highly recommend having your (pan)cake and eating it too at these local brunch spots. Merge has a weekly vegan pancake special, which should not be looked over by meat eaters IMO. When I went to merge for brunch, they had a lemon poppyseed vegan pancake with a vegan cream cheese icing. It was a heavenly stack of pancakes (AKA light as a cloud and just as delicious as a non-vegan pancake). I have reason to believe that merge’s pancake specials are always this good. Their brunch is served Saturday 11:30am-3:00pm. Vegan or not, check it out. They have options for everyone. With a method that can only be described as magic, Ellen Gedra presents to you the fluffiest pancakes EVER. Any words I can muster up about them are not going to do a single bit of justice, so please just go try them at their Sunday brunch, served 11am to 3pm. Probably the best you’ll ever have, right here. 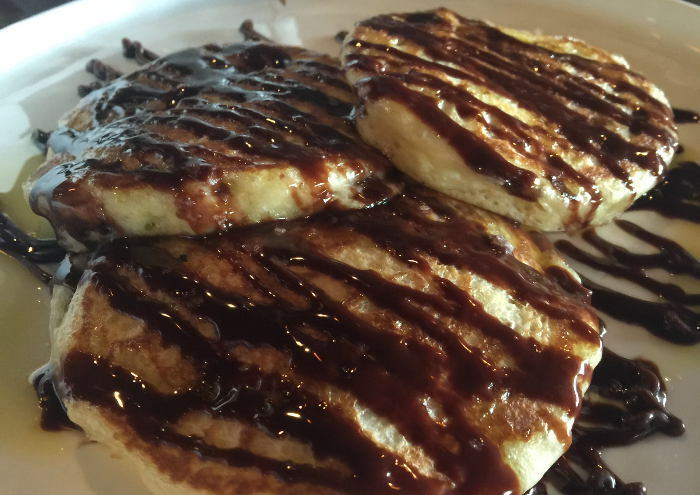 We all know that a pancake craving often can’t be satisfied with something out of the ordinary. Enter diners. 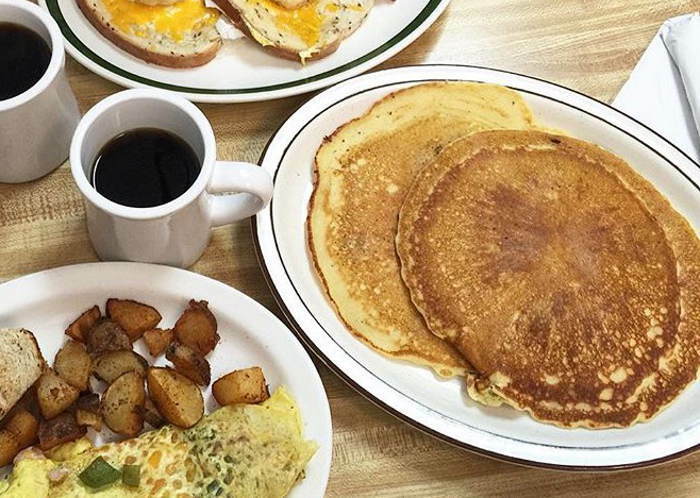 There are a few awesome places to go in WNY when you’re looking for classic, bigger-than-your-head pancakes. When you need to complete a carb challenge for breakfast on Tuesday morning at 7:30am, these places have your back. 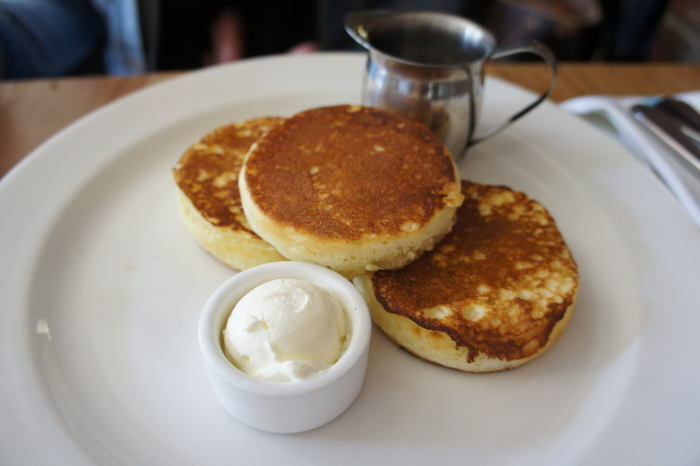 You can never go wrong with a fat stack of pancakes that’s served with half a stick of butter. At Bertha’s, you can even tickle your fancy with something extra too – like banana walnut, blueberry, or chocolate chip. Bertha’s is open Monday through Saturday from 7am to 2pm and Sunday from 8am to 2pm and it’s just plain old good. The secret is out. A few years ago, Nick’s Place was a spot that people drove past unknowingly, rarely mentioned in the hopeless ‘where can I quickly cure this hangover’ conversation. A Black Rock temple, this no-frills greasy spoon will remedy that hangover and more. And of course the pancakes are just what you need, whether they’re your whole meal or split between the table for dessert. 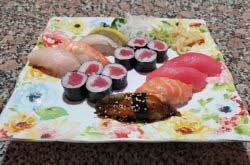 Nick’s is open 7am to 3pm everyday. I couldn’t make this list without including this staple. I can’t argue their claim, as I am still as shamelessly in love with their pancakes as I was when I was seven years old. My personal favorites are pecan and peanut butter, but you really can’t go wrong so choose what sounds best to you. These super rich yet airy pancakes are delicious, but you must be willing to wait in line if you choose to go anytime on Saturday or Sunday morning/early afternoon. 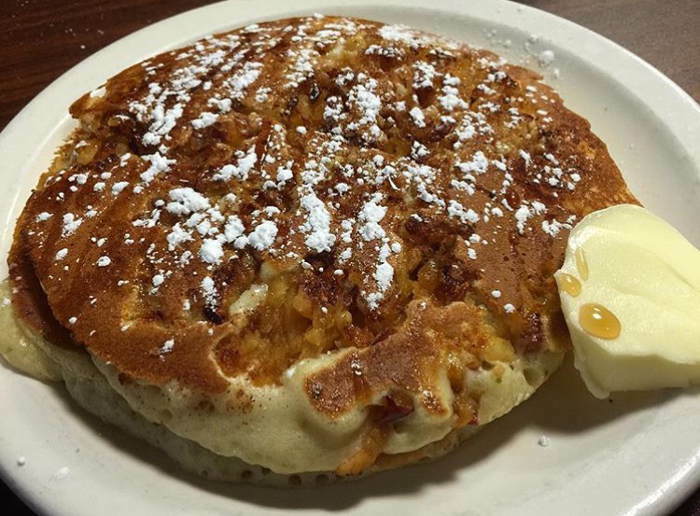 The Original Pancake House is open 6:45am to 8pm daily. Brinner anyone? I think yes. Four words: Apple Cinnamon Walnut Pancakes. If you can eat a full stack to yourself and feel inclined to have a friend record you doing so, DM @buffalobrunch this food-conquering feat and your next stack is on me. I’m serious. Check Sophia’s out Tuesday through Sunday from 7am to 3pm.